ONCE OR TWICE A YEAR France's National Museum of Technology, on the nondescript rue Vaucanson in Paris, announces a special demonstration. On the second floor, at the end of a corridor of antique steam engines and jacquard looms, the museum’s Theater of Automates swings open its doors. At the bottom of a small, dark auditorium, the Keeper of Automates takes a few of his oldest, most fragile exhibits from their locked glass cases. White gloved, wearing a lab technician’s spotless coat, he places the items gently on a table. A capacity crowd of perhaps 80 people, nine-tenths of them (it seems) screaming children, leans forward as he spreads out his gaily painted mechanical toys—automates—and under a single focused light winds them up, one by one. The climax of the demonstrations is always the same. After the clown who tips his hat and rolls a ball, after the tin rooster that hops and crows, after a half-dozen such wood and metal creatures strut across the table and perform their stunts, the Keeper’s ghostly hands reverently lift into the light a doll seated before a miniature dulcimer. The doll is about 18 inches high. She wears a beautiful golden silk gown. Her hair is also golden, her eyes sky blue. She was created in 1784, just before the Revolution, by a German clockmaker named Peter Kintzing and a French cabinetmaker named David Roentgen, and one year later she was presented as a gift to Marie Antoinette. The Keeper’s fingers turn a key, and the doll begins to strike the dulcimer’s strings with two tiny hammers she holds in her long, delicate hands. This is not a music box, you understand; there is no rotating drum in sight, no clockwork brass teeth. Virtually all automates are powered by some kind of wind-up engine. In this case, a spring motor hidden under the stool sets in motion an astonishingly complicated system of cams and levers, so that the dulcimer player’s hands actually raise and lower the hammers and visibly tap the individual strings of the instrument. The doll periodically turns her head to regard, with a smile, her audience. Her chest seems to rise and fall. She actually plays her music, her admirers sigh, just like a real person. But there are always a few who watch her performance not with admiration but with panicky unease. Once in a while, seized perhaps by the same spooky feeling that made early audiences flee movie theaters, someone will jump abruptly to his feet and hurry out. Such a person, I have had it explained to me, is probably experiencing what Freud called the feeling of the “Uncanny”—the terrifying sensation that arises when something cold and inanimate starts, mysteriously, to move and stir before us—when, say, a doll comes to life. Automates of various kinds have been around since antiquity, as toys or curiosities. But in the middle of the 19th century, in one of the odder artistic enthusiasms the French are famously prone to, a positive mania for automates like the dulcimer player swept the country. People flocked to see them in galleries, museums, touring exhibitions. Watchmakers and craftsmen competed to make more and still more impossibly complex clockwork figures, animals and dolls that would dance, caper, perform simple household tasks—in one case, even write a line or two with pen and ink. The magician Robert Houdin built them for his act. Philosophers and journalists applauded them as symbols of the mechanical genius of the age. Like so many such fads, however, the Golden Age of Automates lasted only a short time. By about 1890 it had yielded the stage to even newer technologies: Edison’s phonograph and the Lumière brothers’ amazing cinematograph. Yet as every novelist knows, a story always starts earlier than we think. The strange French passion for automates had its true beginnings not in the middle of the 19th century but at least a hundred years earlier, in the cool, absurdly overconfident philosophical speculations of the Enlightenment. And paradoxically enough, this passion had less to do with philosophy than with blasphemy, hypochondria, and a cheerful and Frankensteinian hubris. WE CAN STEP BACK OUTSIDE to the little street where the Museum of Technology sits. Jacques de Vaucanson, for whom the byway is named, was born in Grenoble in 1709, at the very dawn of the Age of Reason. 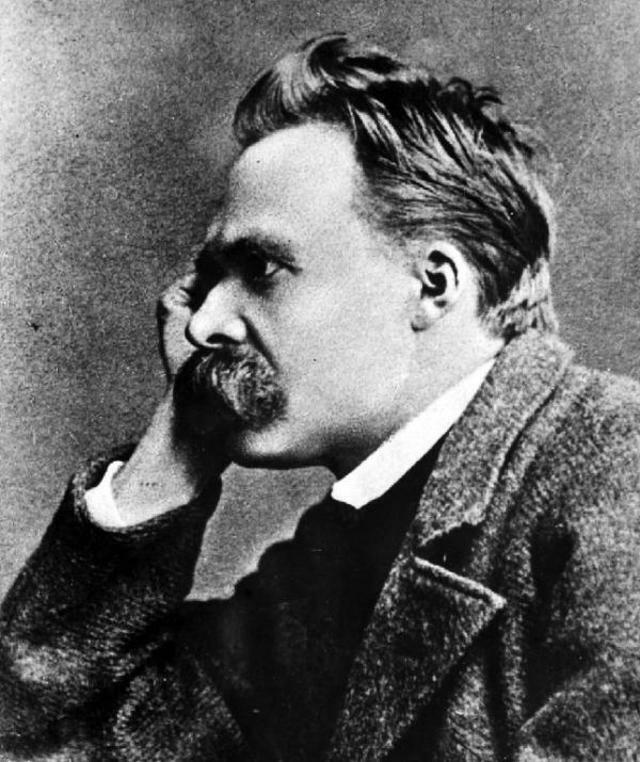 From earliest boyhood, he exhibited both an obsessive hypochondria and a remarkable aptitude for mechanics. At the age of six or seven, he built a clockwork boat that propelled itself across a pond. A few years later, as a novice in the religious order of Minimes in Lyon, he constructed several automates or androids—maddeningly, we have no description of them—that could serve dinner and clear away the plates. A mechanical boat was one thing. But an automate that acted like a human being! The creation of life, the monks angrily reminded their young novice, was God’s business, not man’s; Vaucanson’s experiments must cease. The frustrated youth suddenly declared (not for the last time) that he was suffering from an unnamed but grievous illness, whereupon the monks released him from his vows. He gathered his tools and sped off to Paris to study, of all things, human anatomy. Soon enough, Vaucanson found himself in the company of certain philosophical “materialists”—notably the celebrated surgeon Claude-Nicolas Le Cat—who were inspired by the audacious Enlightenment idea that life is a physical, not a spiritual, phenomenon. In a few years, Julien La Mettrie would crystallize their thought in his scandalous book L’homme machine (1746), in which he argued that the human body was no more than an automate itself and might be imitated (or created) by a sufficiently clever mechanic. Indeed, the surgeon Le Cat had long been at work on such a project, though without much success. His lofty goal was to create an “automated man” whose blood flowed, whose leather lungs inhaled and exhaled, and whose brass glands exuded secretions. Le Cat intended no blasphemy, however. His creature was merely to serve for surgical demonstrations and experiments. Vaucanson was an extraordinarily apt—and competitive—student. In early 1738, following another obscure bout of illness, he rented a showroom in the center of Paris and announced, like a Gallic P. T. Barnum, the exhibition (to paying customers) of his own mechanical man. This, we know from numerous witnesses, including Denis Diderot, who wrote about it for his Encyclopédie, was a large wooden automaton—more precisely, an android—painted entirely white to look like marble and modeled after a well-known statue in the Tuileries Garden called The Flute Player. Wood’s wonderful book Edison’s Eve (2002) is the single best account of the Enlightenment’s quest for mechanical life. She sees clearly that what was so remarkable about Vaucanson’s Flute Player was not its mechanical ingenuity, the gears and pulleys and levers hidden in its torso, but the fact that it breathed. Other musical automatons over the years had simply rung bells or struck drums, like marching figures on a church clock. But the Flute Player, thanks to a pair of bellows in his chest, did something that seemed to go beyond mechanics and into the world of biology. And in doing so, as Wood notes, it raised the philosophical question of what it meant, exactly, to be human. This is, of course, the question at the core of so much Enlightenment thought. It marches across the titles in any 18th-century library—David Hume’s Treatise of Human Nature (1739–40), John Locke’s Essay Concerning Human Understanding (1690). It lies behind the period’s fascination with so-called wild boys—abandoned children found living alone in the French and German forests: If they cannot speak and have no sense of social relations, can they be truly human? It is nearly the whole point of that central Enlightenment text, Gulliver’s Travels (1726), in which the character of human nature is graphically explored: Are we insignificant and comic like Lilliputians? Great and brutal like giants? Rational like the talking horses? Hopelessly bestial like the grunting and snarling Yahoos? Are we only flesh-covered automates, fashioned by the celestial Watchmaker? It is our question too, of course. We see it raised today in the profound psychological studies of Steven Pinker, in the “robot” novels of Isaac Asimov, and in the theories of artificial intelligence of Raymond Kurzweil, which propose that the brain is essentially a computer that can be replicated mechanically. In September a conference was held in Paris, not far from the rue Vaucanson, on the subject of “Le Cerveau et la Machine” (The brain and the machine), based on the speculative work of Swiss artificial intelligence researcher Frédéric Kaplan. As if to create a kinder, gentler Frankenstein monster, an MIT graduate student recently devised a robot that can bake chocolate chip cookies. And to bring the idea full circle, scientists at Waseda University in Tokyo have created a robot, complete with top hat and rubber fingers, that . . . plays the flute. Vaucanson, however, was less a philosophical theorist than a practical, even greedy businessman. 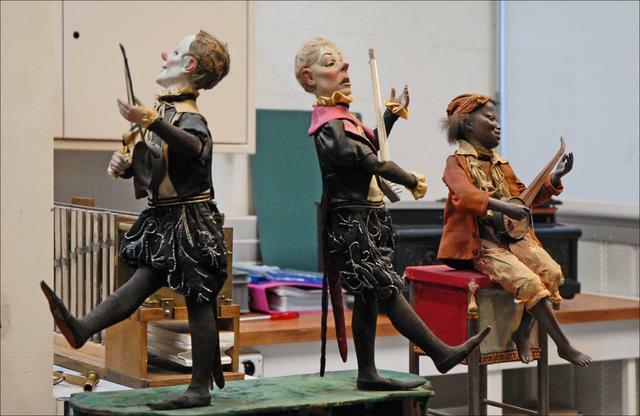 In 1739, as profits from the Flute Player’s performances began to decline, he added two new automatons to his exhibit. One was a pipe-and-drum player. 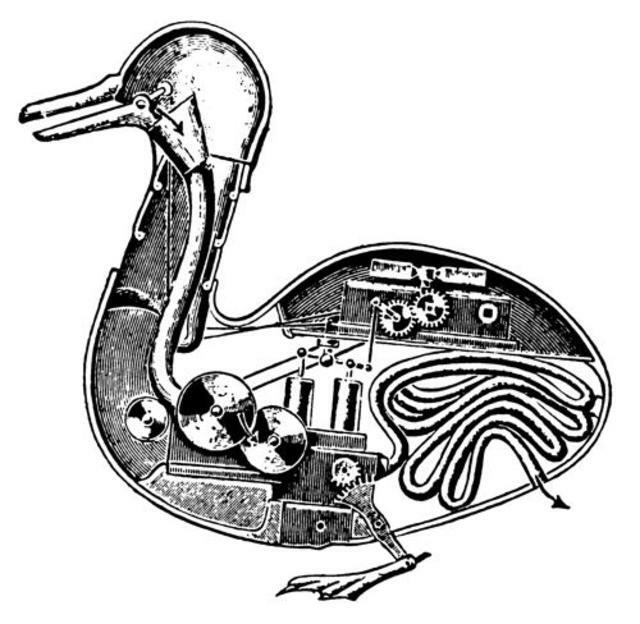 The other—which was to make him, for a time, one of the most famous men in Europe—was a mechanical duck. And not merely a wind-up duck that flapped its wings and quacked and turned its head. If you held out a bit of food in your palm, the duck’s head would lower, its beak would fall open, and the automaton would actually gulp down the morsel. And then, some minutes later—Reader, I am not making this up—the duck would excrete it. THERE WAS AT LEAST ONE PERSON WHO REGARDED THE DUCK WITHOUT IRONY. Louis XV was not quite 30 years old when he traveled from Versailles into Paris to see Vaucanson’s exhibition. He was motivated by his passionate interest in science; but the “Beloved King” was also quite conscious of his own frail health and was unusually close to his team of physicians. Descriptions of the automate had evidently sparked an idea in his mind. After studying the duck closely, he called its creator to his side and posed a bold question, scientific but tottering on the edge of blasphemous: Could Vaucanson possibly make something of the same sort . . . in which the blood flowed? Thus was born Vaucanson’s double life. On the one hand, having sold his automates and sent them off on a European tour, he took up, as a perk of his new friendship, the remunerative post of Royal Inspector of Silk Manufacture. Quickly, almost casually, he redesigned the looms used in the great factories in Lyon, displaced a huge number of silk workers from their jobs, and set off one of the first riots of the Industrial Revolution. At the same time, more or less secretly, he began work on the king’s project. Secretly, because what he and the king had in mind was far grander and more outrageous than Le Cat’s surgical model. What they intended to construct was nothing less than a life-size figure that would imitate the human body in all its biological functions—breath, blood, digestion, movement—a perfect android, an automate that would stand and walk and no doubt peer curiously at the brave new world around him, that had such creatures in it. Or, as Vaucanson sometimes more poignantly called it, “L’homme saignant,” the Bleeding Man. No one knows how far he got. The work was carried out away from the Church’s disapproving eye, some of it perhaps in the countryside near Lyon. Certainly Vaucanson was paid large sums of money for a number of years, through intermediaries and concealed accounts. But he was handicapped not only by secrecy. He faced the nearly impossible challenge of making his android with only the materials available to him in the middle of the 18th century—brass, wood, wax, copper, and glass. Other inventors have encountered the same problem, of course. The gifted 19th-century mathematician Charles Babbage probably would have invented the modern digital computer—he had the theory right—except for the fact that he had to build his “Difference Engine” with brass and mahogany, not silicon. But one development in materials suggests that Vaucanson may have made more progress than we imagine. In 1745 a scientist named Charles Marie de la Condamine returned from South America carrying a remarkable discovery. The Amazonian Indians called it cahuchu, the French caoutchouc, the English rubber. It was, at first glance, exactly what the inventor needed to make the artificial veins and arteries of his Bleeding Man. But La Condamine brought back only a small sample—and in transport the resin had dried out and lost much of its elasticity. For his experiments, Vaucanson needed better samples in greater quantity, so the king’s ministers made secret efforts to secure more from the French colony of Guyana. The technical problems were daunting, however, and they would not be solved until the next century. As far as we know, Vaucanson continued to work on the Bleeding Man as best he could until his death in 1782. And from notes left by his assistants we gather that the discovery of rubber had inspired him to add one more dimension to the project: With caoutchouc to serve as vocal cords, could the Bleeding Man be made not only to stand, digest, secrete, but also . . . speak? Meanwhile, the duck and the other automates had continued their European exhibitions, changing owners often. We read accounts of their appearances in England and Holland. In 1805 Goethe visited them in Germany. The Flute Player vanished, but the duck reappeared in Milan (at La Scala!) in 1843, in Paris in 1844, and then again in Krakow in 1879, where it was reportedly burned to cinders in a fire. But the duck was clearly, as Gaby Wood says, a “clockwork phoenix.” In the 1930s, in a drawer in the Museum of Technology, a conservator turned up several photographs of a skeletal bird with wings and springs, sitting on a complex pedestal of gears. It looked, if one can say it of something made of brass, quite moth eaten. The photographs are relatively modern and they are marked “images of Vaucanson’s duck, received from Dresden,” but nobody knows when they were taken, or by whom. As for the Bleeding Man, though we have all seen images of his presumed descendant, Frankenstein’s monster, no traces of him have ever been found. It is pleasant to think of someone wandering into an old abandoned barn or attic near Lyon one day and swinging open its doors. In a cabinet, or simply sitting, waiting in a dusty corner, might there be the duck’s great cousin, the tall, glassy-bodied, strangely uncanny Bleeding Man? Would he speak . . . or defecate? Would he lurch and stand up, creaking and clanking, and finally step forward into the sunlight of the 21st century, a ghoulish ambassador from another world? Max Byrd, a contributing editor of The Wilson Quarterly, is the author of a number of novels, including Shooting the Sun (2004). His historical novel Rue du Dragon will be published next fall.